Its so amazing that I have found friends here. A friend whom I called 'true online friends".I am grateful for the wonderful friendship we have made. Hope we all continue to communicate for years to come. I would like to thank LARA and Myrna for tagging me. You are also my dear friend. Special thanks to MARLET aka PinaySMILE for teaching me so much. I have learned so many valuable things from you. I wanna give this tag to all my blogger friends. Please grab it. 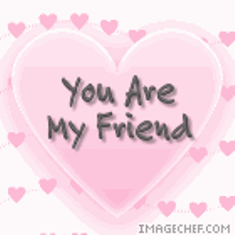 You are all my friends. Sis liit, thanks! Ur always welcome!!! I'm just here if u need help. Thank you sis buntit-:) I really appreciate that.